Location: Mara Lake is located north of the city of Vernon, BC. From Vernon travel north on Hwy. #97A to the community of Enderby. Mara Lake is found on the left (west) side of Hwy. #97A, approximately 22 km. (14 mi.) north of Enderby. Resorts & Campsites: Many resorts and campsites with full facilties can be found on or nearby Mara Lake. 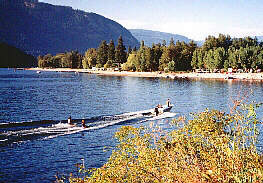 A day use BC Provincial Park with boat launching can be found near the south end of the lake. Fishing Report: Mara Lake, like other large lakes such as Mabel and Sugar, offers a good fishery for Rainbow, Dolly Varden, Kokanee, and Lake trout. 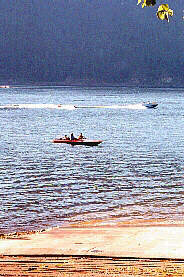 Trolling with lures, plugs, flatfish etc., is the most successful method of fishing this lake. Lake trout up to 18 lbs. have been caught. 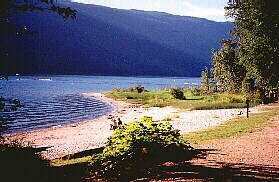 Mara is a prime family recreational area, which is situated close to the world famous Shuswap Lake area. Great climate, excellent camping, fishing, swimming, water skiing, houseboating, horseback riding, and all winter activities with some of North America's best ski hills, are all found closeby. 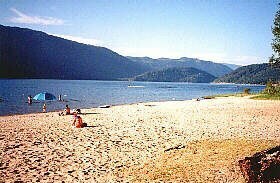 See Shuswap Lake and Gardom Lake.